1) Index Copernicus International (IC, Poland) is an online database of user-contributed information, including scientist profiles, as well as of scientific institutions, publications and projects established in 1999 in Poland. The database has several productivity assessment tools to track the impact of scientific works and publications, individual scientists, or research institutions. In addition to the productivity aspects, IC also offers the traditional abstracting and indexing of scientific publications. Index Copernicus includes (at the end in 2015) more than 13000 scientific journals. Journals registered in the database underwent a thorough, multi-dimensional selection proving its high quality. 2) Research Papers in Economics (RePEc, USA) – Internet project dedicated to the systematization in economics field of research. It is a collaborative effort of hundreds of volunteers in 86 countries to enhance the dissemination of research in Economics and related sciences. The heart of the project is a decentralized bibliographic database of working papers, journal articles, books, books chapters and software components, all maintained by volunteers. The collected data are then used in various services that serve the collected metadata to users or enhance it. So far, over 1,800 archives from 86 countries have contributed about 1.9 million research pieces from 2,300 journals and 4,200 working paper series. About 45,000 authors have registered and 75,000 email subscriptions are served every week. The future plan of the journal editorial board is an active work on the registration of the journal in the international indexing & abstracting services Scopus, DOAJ and others. Referencing the journal by well-known international indexing & abstracting services significantly expands its distribution and the possibility of promotion of scientific research. It contributes to the growing of scientific rankings for both the journal and the scientists and institutions that they represent. 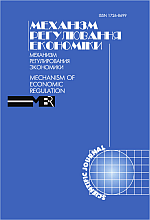 ‘Mechanism of Economic Regulation’ is in the Top 20 Most Cited Scientific Editions of Ukraine! According to the ranking of the most cited scientific editions of Ukraine, according to Google Scholars data (2007–2011 years), published on the website of Vernadsky National Library of Ukraine (http://www.nbuv.gov.ua/portal/rating_journals.html), International Scientific Journal ‘Mechanism of Economic Regulation’ published by the Department of Economics and Business Administration of Sumy State University (editor-in-chief – Dr., Prof., Honored Scientist of Ukraine, Head of the Department of Economics and Business Administration Leonid Melnyk), ranked 20th among Ukrainian scientific journals of all branches of science, with a five-year h-index (Jorge E. Hirsch Index), which is equal to seven. 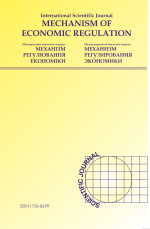 It should be noted that International Scientific Journal ‘Mechanism of Economic Regulation’is the only scientific journal of Sumy State University, universities and research institutions of the Sumy region, which was included in this rating (it includes 100 leading domestic scientific journals of all research branches). Moreover, ‘Mechanism of Economic Regulation’isthe only one from the Top 20, which is published by the state institution of higher education (almost all other scientific journals are published by the National Academy of Sciences of Ukraine and private organizations). In the Top 20: 17 scientific journals published in Kiev and the only one in the city of Kharkiv, Lviv and Sumy. If we select scientific journals that publish research results in the field of economics, ‘Mechanism of Economic Regulation’took the eleventh place among all indexed Ukrainian economic journals.